Rating: 4 stars --- yes, that is correct --- a $2.00 cigar with a 4 star rating! A month ago, I was talking to an old cigar-smoking friend from my Air Force days who kept telling me about the incredible deals offered from Cigars International. Okay, I have ordered from a lot of different on-line venues like Thompson, Famous Smoke, Mike’s, and Holt's, to name a few. Everyone claims to offer the best deals on the best cigars. I have in the past found them all to be close to the same price and no one really has that “Oh, I just cannot pass up on that deal” type of pricing. Then I saw the ad that Cigars International has for E.P. Carillo 2nd’s. They were offering 15 cigars for $29.50 at supposedly a 74% discount. I remembered that Ernesto Jr. was the creator of La Gloria Cubana (the Serie R is one of my all time favorites). I had smoked a couple of EPC’s in the past but could not remember what they were like. I decided to buy one at a local shop which cost me $9.00. What?!?!? "Note: A variety of wrappers are included - natural, maduro, etc. Due to the low price, I can’t let you pick the blend. But you are guaranteed to get a full bundle of the same cigar." Can’t pick your blend and get a full bundle of the same cigar. There were only two sizes available, Robusto and Toro, giving way to more skepticism. I ordered them anyway, for $2 a stick, how bad could it be and I was prepared not to expect much. When they arrived I compared them to the one I bought in the store. The size and shape was right but they were maduro’s, not a natural. It was going to be difficult to do a comparison smoke, so I saved the $9.00 cigar for later. I am happy to report that these 2nd’s smoked very well, and other than an ugly wrapper, it was a good cigar and well worth the $2.00 price. I still wanted to try a comparison smoke. Since this bundle was good, I took a chance on another hoping for natural wrappers. I lucked out and they were the same wrapper as the store bought one. The first bundle – nice triple cap, good ash and even burn. It was not a Serie R, but it smoked well. My Air Force buddies, Bill and Pedro, also liked them. 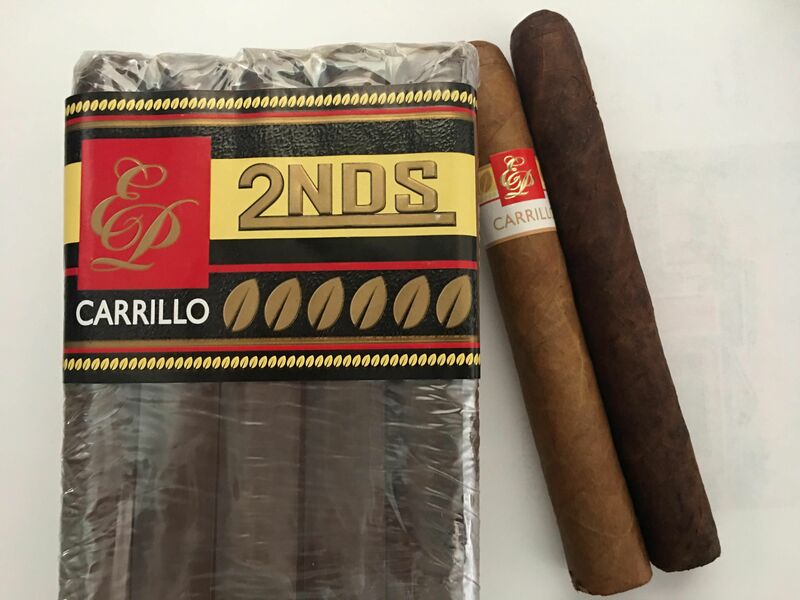 The store bought cigar compared to the first and second bundle of 2nd’s. Notice how the wrappers are nearly identical. IMFHO a good match. But how did they smoke? The pre-light aroma of tobacco barn is typical of a lot of cigars. The draw was okay, not good and not bad, just okay. It was okay enough not to require any re-lights. The burn was a little uneven, but as you can see it does even out and still a good smoke down to an inch and a half. The flavor is very woody with a touch of leather. It does not burn hot nor does the flavor change. The ash was off after one inch and the total smoking time was 90 minutes. It is a good solid smoke at $9.00 but it is a phenomenal smoke at $2.00. I plan to order a third bundle while the supply lasts.